This is my final report before the Annual General Meeting. The last year I consider has been a successful one for the Association. In terms of functions we have held the AGM in September last year at which approximately 40 members attended. Mick Bond and Gina Privitera spoke about their experiences in East Timor. The Back to the Regiment night in March was successful with about 60 attending. Anzac Day attracted a number of members of the association and members of the Toowong RSL. The Association paid for breakfast. Membership wise we have retained the same number of members as we achieved in 2000. (Approximately 200). This is notwithstanding the fact that at the end of 2000 we needed 43 members to renew. Whilst we have good representation from the 1950s to the early 1980s I am still not happy with our levels of membership from the late 1980s and 1990s. We are in the process of attracting recruits from that era. We have now a fairly comprehensive list of all officer graduates of the Regiment from 1980 until 2001. This will assist with this recruiting campaign. The association in the last 12 months has supported the Regiment by the donation of a number of prizes to best students on the officer courses presently conducted by the unit. We have had good sales of ties and pins. We have only a handful of ties remaining (out of 100) and some pins remaining. The history is another issue. A draft history from 1909-2000 has been prepared. I expect it will be complete in the next few months. Distribution is another issue. That is a matter for consideration by the AGM. Financially we are fairly sound. I leave the details to our treasurer to announce at the AGM. I ask that you consider serving on the executive of the association. There is not much of a commitment involved. I thank the present members of the committee for their hard work during the year 2000/2001. I hope they are able to continue to serve in the next year. I would also thank the last Commanding Officer LTCOL Wayne Lynch and the new CO LTCOL Peter Jeffrey for their support of the Association over the last 12 months and look forward to a rewarding relationship into the future. 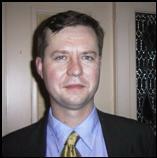 The guest speaker at the AGM will be BRIG Sam Harrison. He will give us an historical perspective on the Regiment. I encourage our younger members to come as it will be of interest to compare the modern day ADF to the one of years past. Of course one can always learn from one’s past. » Current Association membership list – please advise us of any inaccuracies noticed. The Regiment has just completed its mid-year series of courses. This included Module 1A (two weeks) of the First Appointment Course and the Officer of Cadets Officer Course (one week). Both were successfully conducted at Gallipoli Barracks. The next major training activities for the Regiment are Module 1B and another Officer of Cadets Course. Both are to be conducted in the first weeks of December this year. In early August, the Regiment’s ‘establishment’ will be reviewed. This will be conducted as a formation-wide activity in an effort to better standardise the university regiments. I will not be proposing any radical changes from the current organisation. However, it is possible that the RMC Detachment-Townsville may be integrated into the Regiment. On 11 August, the Regiment will be conducting a Beating Retreat ceremony on University Oval No. 7 (the oval opposite the depot). This promises to be an excellent activity in which the Regiment can showcase its talents in drill and music. Lastly, a call for support: The Army Reserve in general is suffering from a lack of new recruits, and so too is the Regiment. We are currently recruiting for a broad range of soldier trades and officer cadet selection boards will begin soon. So, if you have sons, daughters, nieces, nephews or neighbours who may be interested in serving with the Regiment, please ask them to call the Regiment’s Recruiting Cell. The Regiment now has a new series of telephone numbers. Notice is hereby given that the Association’s Annual General Meeting will be held in conjunction with a dinner to be held at the United Service Club Wickham Terrace on the evening of Friday 14 September 2001. 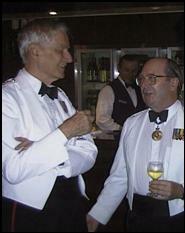 Brig Harrison with Major General Kevin Cooke at the 1999 Regimental Dinner. Below is a further continuation of Garry Collins’ reminiscences of QUR in the 1960s. If memory serves correctly, an extract of this small saga last appeared in the newsletter in November 99. By 1967 the army’s commitment to South Vietnam had increased to a two-battalion task force along with the associated combat and service support units. To provide the necessary manpower the government had decided to introduce conscription rather than call up the CMF. Some members of the CMF were no doubt miffed at the implied insult to our military prowess involved in this decision but others were happy to have been excused a difficult obligation. Once we had turned 19 most of us had probably signed in a company roll book to indicate that we were volunteers for overseas service should the need arise. 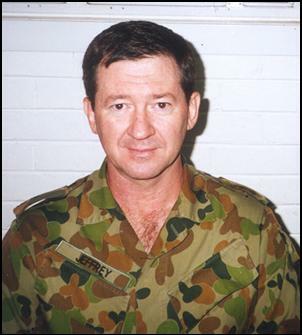 4 RAR had recently returned from Malaya and was the last of the existing all-regular infantry battalions in the ARA to receive an influx of National Servicemen. Once its quota of National Servicemen reinforcements were taken on strength the battalion began the process of preparing for a tour of duty in Vietnam. I spent 5 weeks of the uni vacation in January and early February attached to the Signal Platoon. We spent two weeks doing routine platoon training at Enoggera and then Support Company went to the Jungle Training Centre at Canungra for the 3 week sub-unit course that was a standard component of the training that infantry battalions did in preparation for deployment to Phuoc Tuy Province. Rather than operating in its various specialist roles Support Company was trained in straight rifle company work on this course. The final exercise phase of the activity took me back to Wiangaree for a second visit. As the start of the university term was approaching I was due to complete the attachment and march out the day after we returned from the exercise. Once the activity had gone non-tactical we had walked out along the border track to an embussing area and then drove back to Enoggera arriving at about 1900 hours. Not wanting to waste any time I decided to go home the way I was rather than getting cleaned up before leaving the barracks. I phoned for a cab and when it arrived at the Sergeants Mess I dumped by pack and webbing in the boot and blithely got in beside the driver. He was polite enough to make no comment about my body odour but I swear I could actually see his nostrils twitch. This was perhaps not surprising as I had been wearing the same set of greens for a full week. While I was certainly eagerly looking forward to a hot shower and some clean clothes, I had pretty much gotten used to the smell. That August, at the instigation of Captain Dave Woodrow who had recently been posted there from QUR, a number of us attended an alternate camp with 4 Signal Regiment. At the time, this unit was located on the lower level of Gona Barracks at Kelvin Grove with its headquarters in the two storey building which, in more recent times, has been occupied by the Australian Army Band – Brisbane. In reality 4 Signal Regiment was an “integrated” unit long before the term was officially coined by the army. It was essentially a CMF unit with a CMF CO but it also owned the small contingent of Regular RASigs personnel who manned the signal centre at Victoria Barracks. Its CMF component included the task force signal squadron for 7 Task Force as well as other sub-units normally to be found in a Divisional Signal Regiment. Besides myself, the QUR contingent included an agricultural science student named Ian Crellin and a bloke who was already working for the Department of Primary Industries by the name of Dan Daley (?). During Week 1 at Greenbank we were given introductory training in a range of Corps signals work and then for the mobile communications exercise that occupied Week 2 we were deployed as a three man radio detachment. This meant that we got to drive around the countryside (the Spring Mountain Training Area?) in an Austin Champ and pass radio traffic from designated locations. It did occur to me that driving was often much more pleasant than walking with one’s house on one’s back. However, geography as much as anything else, was to dictate that I would spend virtually all my service in the Corps of Infantry. Intelligence reports indicate that Len Eacott, the foundation Secretary of the Association, has been promoted to Chaplain Colonel as is shortly to be posted to either Land or Training Command HQ as Command Chaplain. Chaplains apparently refer to advancements rather than promotions. Whatever the term, our congratulations to Len who asks for our prayers. q I will be attending the Association’s Annual General Meeting Dinner to be held at the United Service Club, Wickham Terrace, Brisbane on the evening of Friday 14 September 2001 at 1900 for 1930 hours. q My cheque for $55 payable to the QUR Association is enclosed. q I regret that I am unable to attend. Please tender my apology.